A metal replacement or single-ply retrofit would have been labor intensive, expensive, and extremely disruptive to the client.The leaking metal system caused damage inside the building and interrupted the bank’s daily operations. Tearing off the existing system was simply not an option. 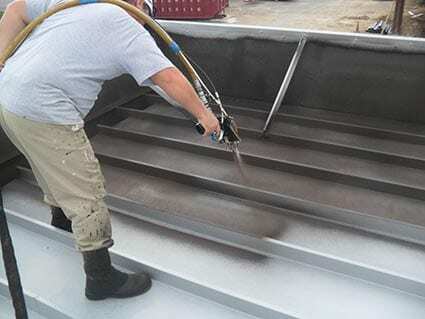 The current metal roof needed to have the rust problem handled and be restored to watertight condition in a short amount of time without any disruption to the bank’s daily operations. Since tearing off the existing roof was not an option, the consultant provided two options to the client. The first traditional option was to install a new 60 mil single-ply membrane mechanically fastened to the existing metal, requiring cover boards to be placed, and fastened down, between each standing seam and then laying a single-ply membrane over, drilling thousands more fasteners into the roof. Not only would the single ply membrane recover be a difficult and noisy installation, but if punctured at any time moisture could easily enter within the new roof system and travel extensively under the single-ply and wick around all of the fasteners. The alternative option was to install a spray application of TRITOflex seamless rubber membrane directly over top of the existing metal at 80 mils, creating a truly monolithic waterproofing membrane over the entire roof system. TRITOflex is a water-based, zero VOC, environmentally friendly fluid-applied system that has the highest elongation in the industry at 1900%. The application is simple, fast, and non-intrusive. The consultant also recommended a ceramic TRITOtherm top coating to be applied over TRITOflex to create an insulating thermal barrier to the sun, resulting in extreme energy cost savings. 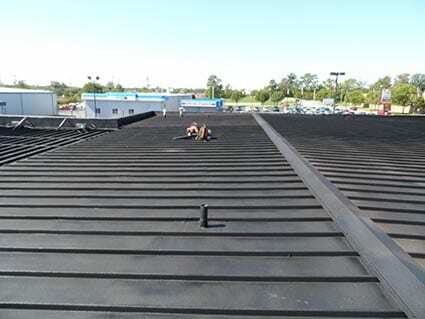 The new TRITOflex fluid-applied rubber roofing system was installed within 5 days without any disturbance or interruption of the bank’s regular operation. Since TRITOflex can be applied directly over the existing system with no separation barrier, underlayment, or fabric reinforcement, the building was restored to watertight condition the same day it was sprayed with TRITOflex. The client achieved a watertight, hail resistant membrane that will withstand any movements of the metal panels underneath and is guaranteed with a 15-year material and labor warranty. They also improved their cooling efficiency substantially with the TRITOtherm insulating top coat.